Failed GOP Candidate Mitt Romney!! The Noisy Room : My nomination this week goes to Mitt Romney. Romney really stepped in it over Donald Trump. Sean Hannity came out and slammed him on being willing to maul someone in his own party, but wasn't willing to go after Barack Obama. There are a couple of reasons for that. One, none of the weenies in the GOP dare to go after someone who is black. They are terrified of being called racist. Second, Romney is a Progressive just as Obama is. He's not as much of one, but he quietly agrees with a number of stances of those on the left. Third, he views Donald Trump as a direct threat to the power structure of the GOP. So, hypocritically he goes out and attacks one of our own in a way he would never savage the left. It's despicable. While I am not a fan of Donald Trump's currently, you just don't do this. I also think this is a calculated move on Romney's part and that is even worse. He asked people to vote for any candidate but Trump that they figured could win their state. That move was meant to fracture the party even further and to deliberately result in a brokered convention. He didn't call for Cruz and Rubio to unite over Trump... he called for party divisiveness. This is exactly the type of thing that has resulted in the rise of Donald Trump. The manipulation, the corruption, the underhandedness, the dishonesty on both sides of the political aisle is epic. Trump is a Frankenstein of the GOP's own making. Romney's lambasting of him was disgraceful and showed the true face of Republican elitists. 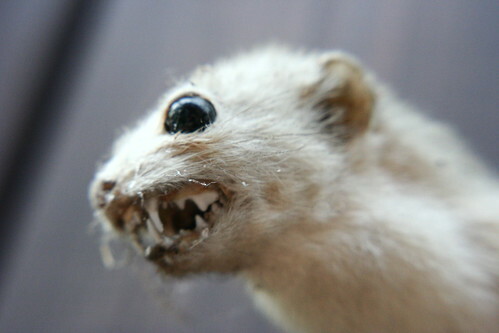 If we have a two-faced weasel, it should go to Romney. The Daley Gator : Bowdoin College for punishing students for have a tequila-themed party. Pretty weaselly! A little History on Bowdoin is fitting here. General Samuel Thompson had a sister that was married to a Tory. She was secretly passing information to her brother on the insidious plans of the Tories. Being ahead of his time, a few days before the start of the Revolution, Thompson kidnapped a Tory Captain, who we now know through British records, was planning to burn towns in the Colonies. Thompson threatened to cut a joint off of Captain Mowatt for each amount of time he specified where his demands were not met. The SJW's of the time were appalled and managed to have the Captain released, whereupon within days the Captain was burning the coastal towns of Maine. Some blamed Thompson and they called it Thompson's War derisively. He gave the land for Bowdoin, for them to be embarrassed by their benefactor. When history has proven him right. The same benefactor who has been forgotten by history because at the Convention he refused to sign the Constitution because of his very passionate anti slavery stance. While they should be calling for their benefactor to be included with our Founders, they try to hide him.